Varalakshmi Vratam is a popular ritual observed by married women in South India and Maharashtra. 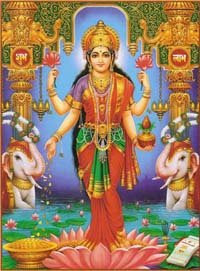 Pujas and prayers are offered to Goddess Lakshmi – the goddess of wealth and prosperity on the day. There a couple of popular stories associated with Varalakshmi Vratam. The most important among them are story of Charumati and that of Shyamabala. According to Skanda Purana, once Goddess Parvati asked Lord Shiva about a vrata that will be beneficial to women. Lord Shiva then mentioned the importance of Varalakshmi Vrata, which is most beneficial Vrata for women. To illustrate the importance of the Varamahalakshmi Vrat, Lord Shiva narrated the story of Charumati. Pleased with Charumati’s devotion to her husband and family, Goddess Lakshmi appeared in her dream and asked her to perform the Varalakshmi Vratha. She explained to her the procedures of the Vrata. The pious Charumati invited all her neighbors, friends and relatives and performed the Varalakshmi puja as directed by Goddess Lakshmi. Soon after the puja, all the people who participated in the puja were blessed with wealth and prosperity. Another popular story associated with Varamahalakshmi Vrat is that of Shyamabala. King Bathrasiravas and Queen Surachandrika had a daughter named Shyamabala. She was married to a prince of neighboring kingdom. Once when Shyamabala was in her parent’s palace, she saw her mother, Queen Surachandrika, driving away an old lady. The old lady had asked the Queen to perform Varalakshmi puja but the queen did not like a beggar advising her regarding pujas and therefore drove her out. A kind-hearted Shyamabala invited the old lady and listened to the greatness of Varalakshmi Vrata. When she returned to her country, she performed the Vrata as directed by the old lady. Soon her kingdom started prospering and the prince was appreciated for his good governance. But parents of Shyamabala had to undergo numerous sufferings and there was suffering all around. The king and queen lost all his wealth and people started revolting against their rule. Hearing about the suffering in her parent’s kingdom, Shyamabala sent pots of gold but the moment Queen Surachandrika set her eyes on them they turned into ashes. Upon hearing this incident, Shyamabala realized that all this is the result of her mother driving out the old woman from the palace. She realized that the old woman was Goddess Lakshmi in disguise. According to another story in the Hindu scriptures, the origin of Varalakshmi Vratha is associated with a game of dice played between Lord Shiva and Parvati. Goddess Parvati who was winning all the games was accused of cheating by Lord Shiva. So they decided to appoint Chitranemi, a gana of Shiva, as the umpire. Chitranemi ruled in favor of Lord Shiva and this angered Goddess Parvati who cursed him to be a leper. Shiva asked Parvati to forgive Chitranemi and she agreed to revoke the curse if he watched Varalakshmi Vratha performed by pious women. The tradition of Varalakshmi Vratha started from then onwards. How to perform Varalakshmi Puja?